It’s September 1919. The war is over, and everyone who was going to die from the flu has done so. But there’s a shortage of husbands and women in strife will flounder without a male to act on their behalf. And in the southern New South Wales town of Prospect, four ladies bereft of men have problems that threaten to overwhelm them. Thank God these desperate ladies have a solution: a part-time husband who will rescue them all. To find him, they’ll advertise. To afford him, they’ll share . . .
How do the ladies’ responses to the challenges facing them reflect their characters a) when we meet them and b) when they are most tested? Can (straight) women and men ever have a relationship in which there is no sexual content? Were the ladies naïve to imagine it might not become a problem? The novel is comic in tone. Does it have a serious intent? How do their childhoods affect the ladies’ relationships with each other? In each of them, who has the upper hand? Is Martin Duffy badly treated? Is he used and discarded or does he benefit from the experience and emerge the better for it? What is the function of the Mayberrys in the narrative? How much does the opinion of the town affect the actions of the heroines? Does a threat to respectability carry equal jeopardy today? 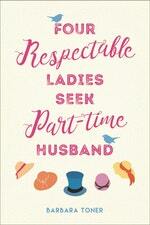 Could all women do with a part-time husband? What rules might make the relationship a successful one?